Alex Mars welds in her Lakeville shop. 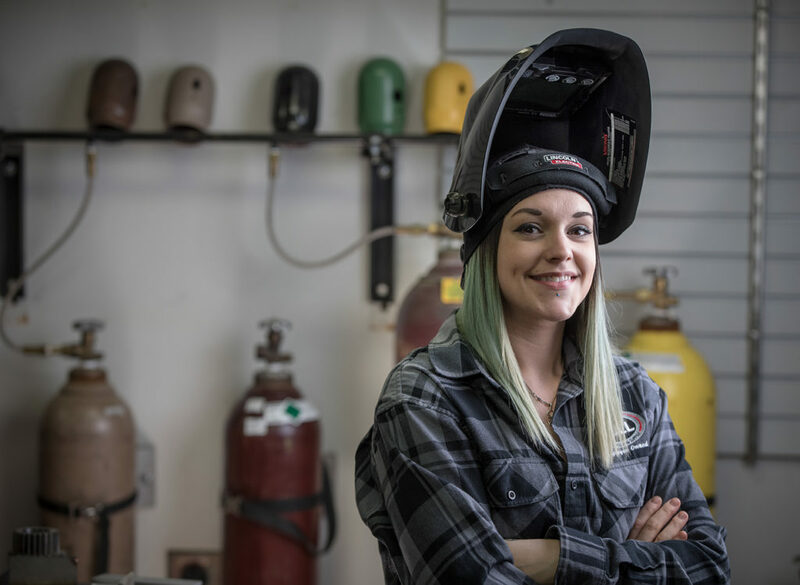 For Alex Mars, graduating with a welding degree from Dunwoody opened up more opportunities than she ever imagined. A 2015 graduate, Mars is currently the manager at Toll Gas & Welding Supply in Lakeville, an employee-owned welding supply company. And as the shop’s only employee, her responsibilities vary depending on the day. Alex Mars, a 2015 alumna of the Dunwoody College of Technology Welding program. And just like her daily routine, the company’s client base is also wide-ranging – from home hobbyist to pipeliner to sculpture artist. 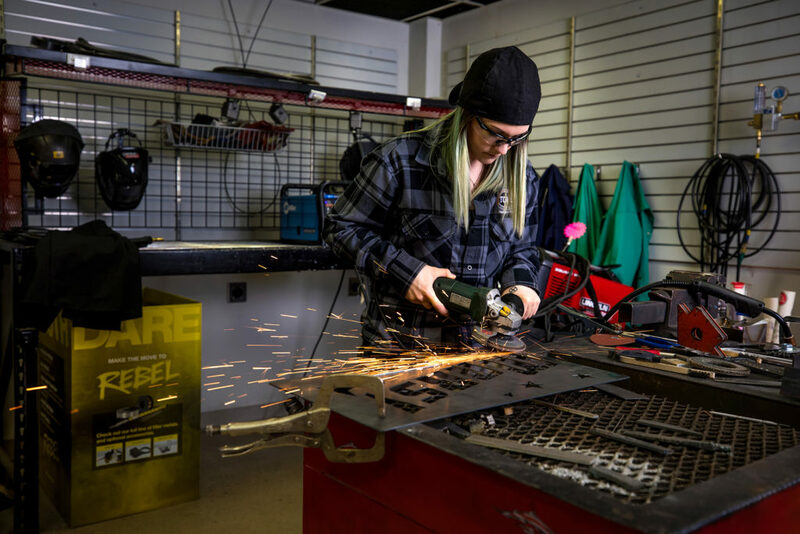 Sharing her welding knowledge with others and exposing new people to the craft is something Mars has come to love. “Last year I planned and taught a Father’s Day Workshop – one of my favorite experiences,” she said. Her position has also given her the opportunity to meet and network with other professionals. 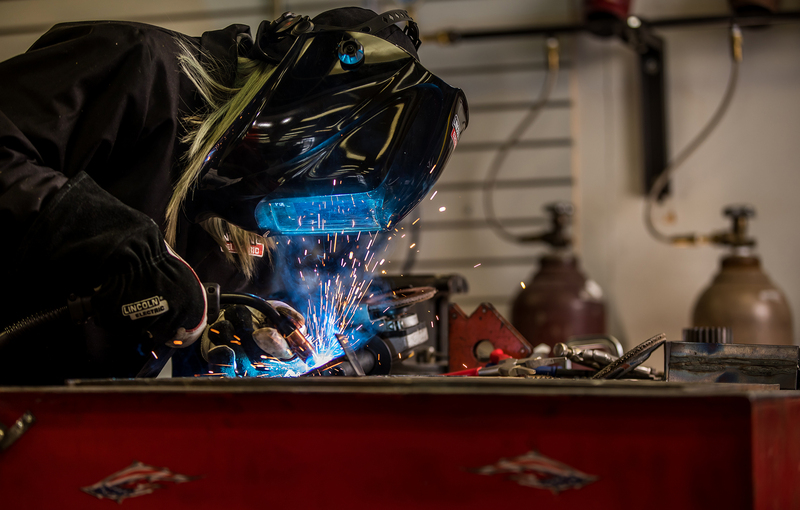 Through those connections, she has gotten to work on a variety of interesting welding projects as well use her skills to make artistic sculptures. Welding wasn’t what Mars had imagined doing after graduating from high school in 2010. She held a number of positions including manager of a restaurant, Nurse’s Aide and Trained Medication Aide – none of which were what she wanted to do for the rest of her life. Alex Mars grinds a sign she created for her father in her Lakeville shop. So when she had the opportunity to try her hand at welding, Mars discovered it was something she enjoyed. That interest in welding prompted Mars to sign up for the welding program at Chart Industries. The program not only provided the training, it also paid the students a salary. But shortly after starting the program, Mars found out that because she couldn’t pass the program’s physical strength test, she wouldn’t be allowed to continue. The next day, Mars walked into Dunwoody and enrolled in the welding program. Mars is grateful for the education and guidance she received at Dunwoody, especially from her instructors Denise Bailey and Mark Schwendeman. It’s a sentiment that others can now say about her. As the shop’s only employee, Mars says her days are always different. Some days she offers welding demos. Other days she does research for clients or keeps welders supplied with equipment and gear they need. Mars encourages others to explore a technical degree like she did. Learning an in-demand skill has helped her in more ways than one.